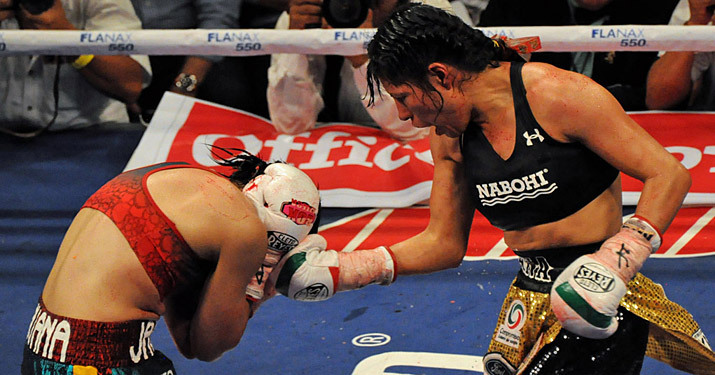 Ana Maria Torres Retains WBC Super Flyweight Title against Marisa Portillo! 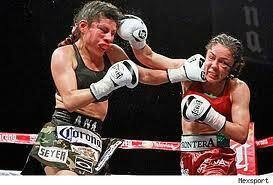 Boxing sensation and Mexico’s own Ana Maria Torres (27-3-3, 15 KO’s) made a successful title defense against the Argentinian challenger Marisa Johanna Portillo (10-4-2) at Las Cabos in Baja California, Mexico by unanimous decision. The judges scored the obviously lopsided battle 100-89 across all three score cards. American referee David Mendoza took a point from Portillo for excessive holding in the sixth round which explains the judges final scoring in the 10 round bout. 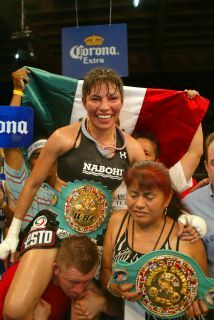 Yesica Marcos, New Interim WBO Super Bantamweight Champion wins by TKO! Argentina’s own Yesica Marco (18-0-1, 6 KO’s) the current interim WBA Super Bantamweight Title holder fought an impressive five rounds before her Brazilian challenger Simone Da Silva Duarte (10-1-0) threw in the towel for the TKO to become the interim WBO Super Bantamweight Title holder. Marco and Duarte had last met on April 9, 2010, when Marco gained the interim WBA title by unanimous decision after ten hard-fought rounds of boxing. 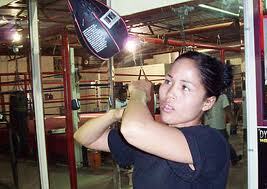 This is Marco’s third successful defense of her interim WBA title. This was also Marco’s first fight in nearly six months having sustained a serious injury to her right shoulder. The full fight is below (starts around 12:00 minutes in, though the pomp and circumstance is well worth it. BTW, check out the packed stadium!). 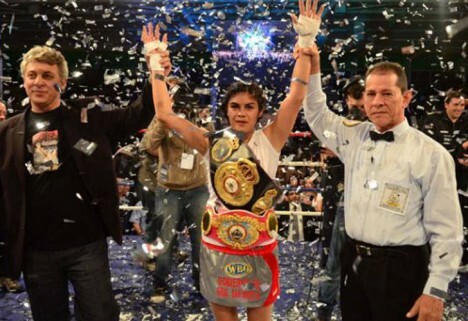 Irma Sanchez Retains WBF Flyweight Title! In a well-fought, surprisingly well-matched, title match, the Women’s WBF Flyweight Champion, Irma “La Guerita” Sanchez (21-5-1, 6 KO’s) was able to retain the championship with a unanimous decision against challenger Susana Cruz Perez (5-3, 2 KO’s). The contest took place in Los Cabos, Mexico and was promoted by Hector Garcia’s HG Boxing. As with many of the higher caliber women’s bouts in Mexico, it was a headlining bout televised to a wide audience on the Televisa network. The judges decision was 97-93, 96-94 and 100-90 in the champion’s favor. 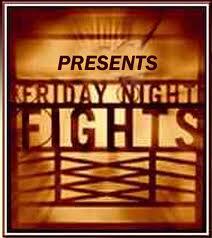 For more information on the bout, check out Saddoboxing.com. 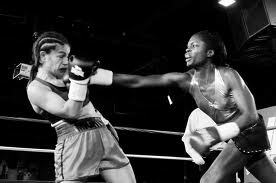 Great Women’s Boxing: Kaliesha West’s WBO title defense on 8/20! In true warrior fashion, Kaliesha West defended her WBO title against challenger Jessica Villafranca through ten rounds of exciting non-stop action! The judges scored the bout 97-95, 99-91, and 96-94. With her win, Kaliesha not only improves her record to 14-1-3, 4-KO’s, but also shows her ability to compete on a wider international stage. Kudo’s to Kaliesha and her team for making the decision to jump to the next level! All I can say is what a great summer for women’s boxing! Next up, California’s fabulous Kaliesha “Wild Wild” West (12-1-3, 4-KO’s) will take on Mexico’s Jessica Villafranca (12-2-0, 6-KO’s) in a 10-round WBO Female Bantamweight championship battle at the Black Pyramid Casino in Manzanillo, Colima, Mexico. The bout will be aired on Mexico’s Televisa network at 8:00 PM, CT as part of the HG Boxing’s “Triple Corona” card. This will be Kaliesha West’s debut fight under the auspices of promoter Hector Garcia, who adds West to HG Boxing’s other phenomenal women’s boxing champions including Ana Maria Torres and Arely Mucino. This is great for women’s boxing in general — and a terrific opportunity for Kaliesha to get to the next level in her career. For further information on Kaliesha West you can add her official fan page on Facebook here. You can also follow Kaliesha West on twitter: @kwildwildwest. NBC sports has a piece on their website by Rick Chandler entitled The Beatdown: The Future of Women’s MMA that’s plain old got me down. I admit that I’m new to MMA — and while I’ve done the odd piece about it, I haven’t got much experience with the sport and only watch it occasionally on television when there’s no boxing on. That’s usually meant catching part of a Strikeforce fight card on Showtime. What had struck me about Strikeforce was the fact that there is always at least one women’s bout on the card, not to mention the seeming popularity of the women’s bouts. Just this weekend I watched the Women’s Welterweight Championship bout between Marloes “Rumina” Coenen and Miesha “Takedown” Tate. Tate pulled out a convincing upset win over Coenen — and again, as a novice to watching the sport with about zero understanding of the politics of Strikeforce, et al, found it to be quite an interesting addition to the world of women’s sports in general. Ugh! What!?! Is there still women’s boxing? Pa-lease! Chandler’s thesis is that with Strikeforce’s recent sale to Zuffa (the UFC’s parent company), a situation may have been set up whereby the Strikeforce roster will be swallowed up by the UFC and the women’s roster jettisoned in the process. Chandler further opines that the UFC doesn’t have the same interest in the women’s side of the sport as Strikeforce because there aren’t enough “stars” if you will, with the name recognition to draw in the crowds. b. Along comes UFC and the potential for jettisoning the women’s roster of the “old” Strikeforce and a repositioning of the brand towards a more exclusively male roster. Hmm… no longer good business??? So back to the contradiction again. If women’s MMA was so horrible why buy Strikeforce in the first place?!? I don’t know about you, but I find this logic to be very twisted indeed. And P.S. — in watching the Tate-Coenen fight I didn’t think about gender, I thought about fighting! Was it interesting? Were they skilled? Weaknesses/strengths and so on. If a fighter has the courage to put herself in the ring why should it matter how big her breasts are or whether she has a cute booty! A fight is a fight. Put Torres-Nava I or II up against any fight card from over this past weekend and what will you come up with in terms of skills, heart, stamina and to use the word again pure courage. I can tell you the answer, none. All I can say at this point is GRRRRRRR. And please, feel free to opine away!